Nisha Priya Bhatia, a senior RAW officer had in 2008 filed a complaint alleging sexual harassment by A.K. Chaturvedi , was arrested, compulsorily retired, and put in a hospital for ‘medical illness’. 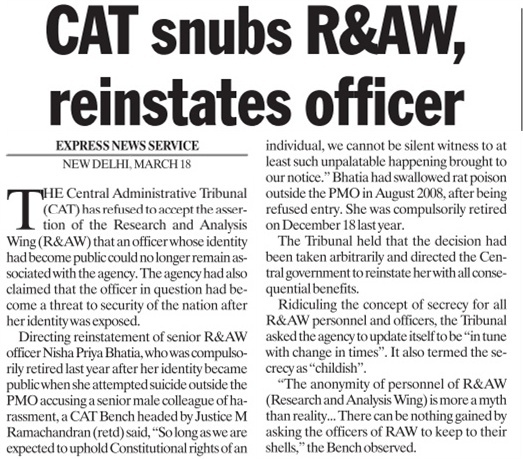 The Central Administrative Tribunal (‘CAT’) today ordered the central government to re-instate her with immediate effect. The officer was given several opportunities to present her case, but she refused to cooperate with the committee. Nothwithstanding, the committee completed the inquiry on May 19, 2008 and found that her allegations could not be substantiated. Moreover, the committee found that her behavior on a number of occasions, duly documented by the committee, appear to indicate a `disturbed state of mind’ and recommended medical counseling. She also attempted to commit suicide outside the PMO. The RAW compulsorily retired her after this stating that her identity has become public, and she can therefore, no longer work in the agency. The agency also claimed that she had become a threat to national security after her identity had become exposed! !